Home Agile Daily Scrum – Three questions no more! When one looks at these questions without knowing the purpose of the event; it can easily trigger the thought that the Daily Scrum is status report meet where Development Team comes and answers these three questions. However, even with this change the idea that – Daily Scrum is an inspect and adapt event for the development team; where it needs to understand how it intends to work together as a unit to achieve the Sprint goal – was still not very clear. The focus was on Sprint goal but many teams still simply answered the questions. A team that is just starting up with Scrum may still use it. Now, there is another challenge. No more questions – then what do we do? During my training when I clarify the above mentioned facts about Daily Scrum, I often end facing the question – If we do not have to answer the three questions then what do we do in Daily Scrum? Ask the team members, how would they do it if they were unaware of 3 questions and have to keep this event within time-box and focused on the Sprint goal. Ask the team how can we raise the transparency around the work done so that we can accomplish the Sprint Goal. Have your visual indicator (ex: burn-down chart) in front of you and discuss around it. 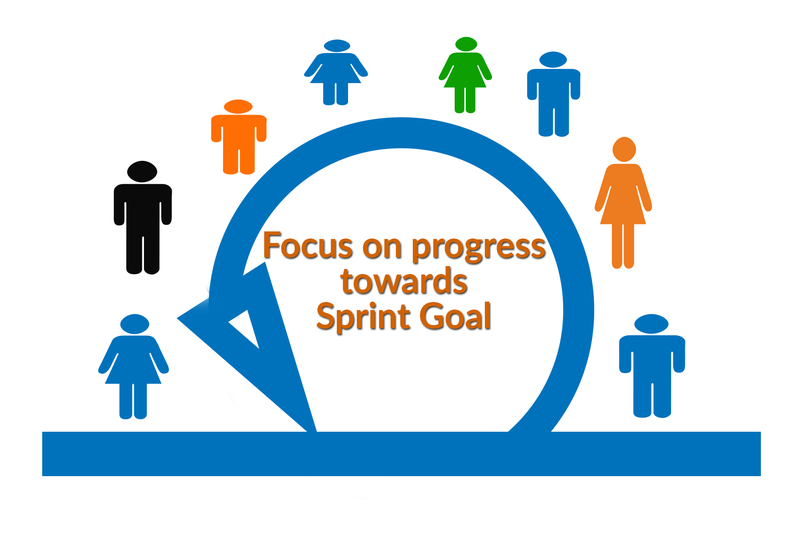 Daily Scrum event is a planning event so, plan your day to make progress towards Sprint goal. Identify key dependencies and ways to mitigate them. Ask/answer, as a team, what can be brought to a closure today. Be courageous and respectful to ask a peer what is delaying their work if you see them stuck. Look at your DoD and walk through your Sprint Backlog to see what will it take to meet the Sprint goal. Do a “Fist of Five” to check confidence of the team to deliver the increment at the end of sprint. Ask if a team member can help a peer if they are stuck with something. I hope this article is helpful to the readers. Read More about Daily Scrum here or at scrum.org.